Does this mean I get the chance to 'mirror' your trades? What type of clients is your Shadow Investment Service aimed at? What are your annual investment return aims? What is your investment track record? How much does the Shadow Investment Service cost? I believe you make a promise to your clients. What is that promise? How does your ‘Shadow Investment’ Service work? How do your clients ‘shadow’ your portfolio? What does your Shadow Investment Service include? What is the minimum investment period? Who would be my dedicated contact at your firm? How have you performed in bear markets? Do you have any growth illustrations using real money? Are you authorised and regulated by the Financial Conduct Authority (FCA)? Are you covered by the Financial Ombudsman Service? Do you offer ‘personalised investment advice’? Have you ever been disciplined by the FCA or other organisation? Do you have a 'code of ethics'? Does your company have professional indemnity insurance? What are your investment team’s qualifications? Do you have any reviews or testimonials from satisfied clients? 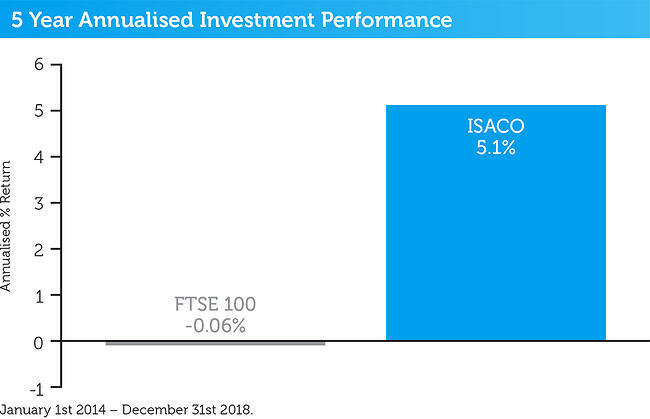 1 Internal estimation taken January 1st 2015 of total ISA and pension assets owned by the ISACO Investment Team and ISACO premium clients. 'Shadow Investment’ is a unique service which gives you the opportunity to look over our shoulder and buy the same funds that we personally own, effectively piggybacking on our expertise. One of the secrets to our impressive returns is to buy our funds using ‘wrappers’ such as Individual Savings Accounts (ISAs) and Self Invested Personal Pensions (SIPPs). Both of them are perfect for helping to boost your annual investment returns. The key difference with our service is that we put our money where our mouth is. 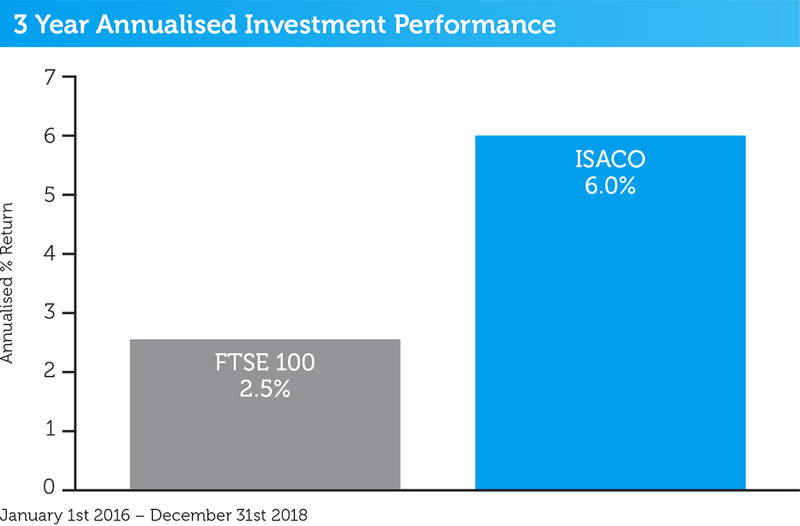 And as an ISACO premium client, you’ll have the opportunity to mirror our ‘market–beating’1 investment portfolio throughout the year. This gives you the potential for achieving almost identical returns to the ones we make. The Shadow Investment Service has been created to save you the hassle of having to become an investment expert and allows you to keep full control of your investment account. It takes the hard work out of investing and helps to remove the uncertainty of knowing what funds to buy, when to buy, if to hold and when to sell. 1January 1st 1998 - December 31st 2018 ISACO 163.3%, FTSE 100 30.7%. Yes, throughout the year you get to see what we are doing with our own personal money and if you agree with our fund pick, you have the chance to mirror the trade. This means you are in the driver’s seat at all times and can decide which funds you want to buy and how much you want to invest. Due to our outstanding track record of performance growth, most clients mirror our exact movements throughout the year. Some clients however, do begin their term with us by partially mirroring and as time passes, their confidence tends to grow in our ability, which results in them deciding to mirror us to the letter. Shadow Investment is a premium service suited to ISA and SIPP investors with over £250,000 actively invested. It’s been designed to take the hard work out of investing for DIY, self-directed investors who haven't got the time to sift through the thousands of investment funds available. The majority of our clients are wealthy retirees, business owners, self-employed professionals and corporate executives. However, we also have clients from the financial services sector, such as IFAs and wealth managers. All clients enjoy unrestricted access to both Stephen and Paul Sutherland, ISACO’s two founders. This gives you the peace of mind of knowing you’ll always be dealing with the most senior members of the company, who are both highly experienced investors. The two brothers are fanatical about client care, which ensures lightning quick response times to any questions or concerns you may have. Our aims are 6-8% per year. We are delighted with the returns we’ve made over the previous three years1. From the beginning of 2016 to the end of 2018, we annualised 6.0% versus the FTSE 100’s 2.5%. Past performance is no guarantee of future performance. We are also delighted with the returns we’ve made over the previous ten years3. 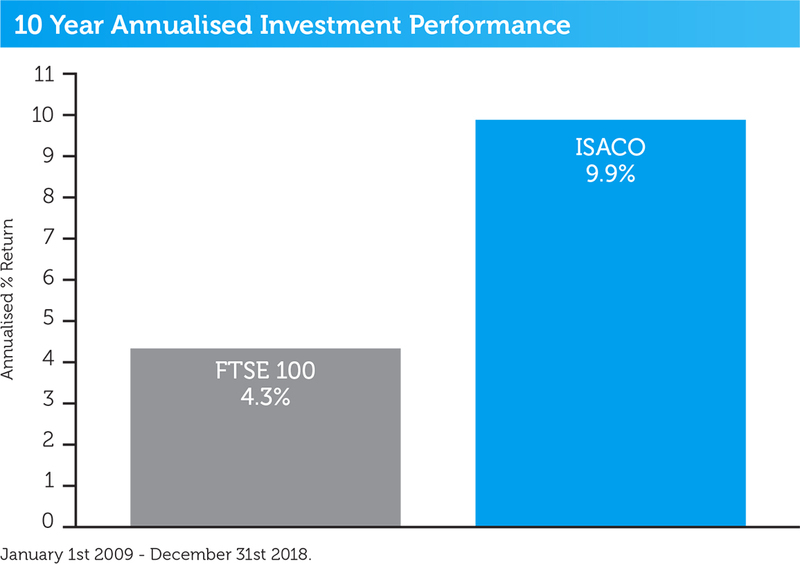 From the beginning of 2009 to the end of 2018, we annualised 9.9% versus the FTSE 100’s 4.3%. Past performance is no guarantee of future performance. Finally, the FTSE 100, our benchmark, has annualised 6.0% since its inception 35 years ago4. That tells us that if we can beat the FTSE 100 over the long term, we’re going to be blessed with a reasonable rate of return. Shadow Investment is a premium service that comes at a low cost. There are no fees to pay for performance, no initial charges1, no upfront fees2, no switching fees, no exit fees and no ‘per hour’ charges. The only fee you have to pay is a service fee which is typically 1%3 per year. 1 Initial charges on investment funds. 2 For portfolios of £250,000 and above. 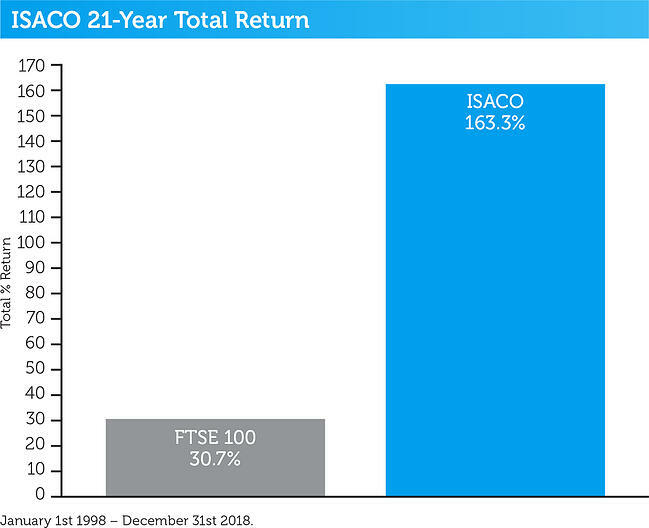 2 January 1st 1998 - December 31st 2018 ISACO 163.3%, FTSE 100 30.7%. 3 Initial charges on investment funds. 4 For portfolios of £250,000 and above. 5 Using ISA and SIPP wrappers. Shadow Investment allows you to look over our shoulder and buy the same funds that we are buying. It’s an intensely personal service which gives you the opportunity to piggyback on our expertise and makes investing easier, simpler and much more enjoyable. Because we have ‘skin in the game’, it creates a huge incentive to deliver superior performance. The service gives you the potential of achieving almost identical returns to the ones we make. It’s been created to save you the time and effort of having to become an investment expert and allows you to keep full control of your investment account. We have an active investment strategy which aims to control risk and deliver superior performance. The investment team invest in a number of actively managed funds to form a complete investment portfolio. The team, led by Stephen Sutherland, select what they believe to be the best funds in each asset class, monitor all the investments selected, replacing under-performers and continuously rebalance the portfolios with the aim of maximising growth potential and managing risk. Fund allocations can be adjusted quickly to adapt to changing economic conditions or to capitalise on opportunities as they arise. The investment process involves identifying the world’s best managers and combining them effectively to achieve diversification and reduce our exposure to risk – this strategy ensures our return is not dependent upon any one manager’s performance. We have resources that allow us to identify who we believe to be the world’s most skilled investment managers, wherever they are in the world. Through structured research and highly informed decision-making, our investment team can focus on taking bold, active decisions that they believe will positively contribute to superior performance. Our team use a range of tools to fully understand the funds selected and use that deep understanding to build portfolios that seek to create the most compelling blend of different managers. Our strategy and the underlying fund managers are then monitored and reviewed. Whenever we change our view on a fund, or identify a better opportunity, we take swift, decisive action. In selecting the top experts in a market, country or sector, our Shadow Investment solution creates optimum diversification and improves risk management. Active investing is the process of selecting funds to add to and remove from a portfolio, based on fundamental and technical analysis, in an effort to outperform the broader market or a specific index on a risk-adjusted basis. Our Shadow Investment service has been purposely designed to take the hard work out of investing. Five days per week, we send you a Daily Market Update which offers the opportunity to shadow our fund picks. The update takes under three minutes to read, however many of our client’s scan the information which takes less than sixty seconds. In about 99% of all the updates we send, we’ll report that we are taking no trading action. However, in approximately 1%, we’ll report that we are about to make a ‘switch’ in our portfolio. That simply means that we will be placing a trade and these are the rare days clients get the opportunity to shadow our fund pick. Typically, we only make about 4-5 trades over the course of a year. We make the trades in our portfolios and if you want to replicate the trade we’ve made, you’d simply make the same trade in your own investment account. 241 ‘Daily Market Updates’ and 12 editions of ‘The Big Picture’. ISACO co-founder Paul Sutherland acting as your direct contact and client manager. 365 days per year support. It’s a personal decision and there is no set minimum limit. The good news is that because you are controlling your own investment account, you have the freedom to invest as little or as much money as you like. You can start small and increase the amount as your confidence grows. Clients who benefit most from our service have over £250,000 actively invested however when you start off, you might decide to use just a portion of your overall portfolio and when you see a confirmation of our abilities, you’ll have the opportunity to invest more. If you follow our guidance, you will be investing in equity based funds linked directly to the stock market and as all advisers will tell you, a five-year term should be your absolute minimum. Investment professionals1 say that to reduce risk of loss, a seven-year investment horizon is better than five and ten years, better still. Investing over the long-term can help reduce – and possibly eliminate – the risk of loss to your starting capital. For example, Fidelity conducted a study1 and discovered that when investing in international markets, if you invested over a one-year period, there was a 24.9% chance that you’d lose some of your initial investment. However, if you invested over a ten-year period, there was a 0% chance of losing anything from your initial investment. As you can see, the possibility of losing money decreases the longer the investment time frame. 1.Source: Fidelity’s research 1.06.83 to 2.06.08. Morningstar. FTSE-A All Share Index with net income reinvested and MSCI World Index-£ with net income reinvested. Basis: bid-bid net of UK basic rate tax. Cumulative returns over 1, 5 and 10 years on all eligible time periods at one month start intervals. Rather than being passed onto a junior member of our team, you would always speak to somebody senior. If you had a question or concern, you’d simply contact your client manager, Mr Paul Sutherland, ISACO’s co-founder and Managing Director. His personal telephone number is 01457 831 642. This is a good example of the type of highly personal service we offer. In the three year ‘tech crash,’ over the period 31st December 1999 to 31st December 2002 our annual return was -10.9% versus the FTSE 100’s -17.2%. 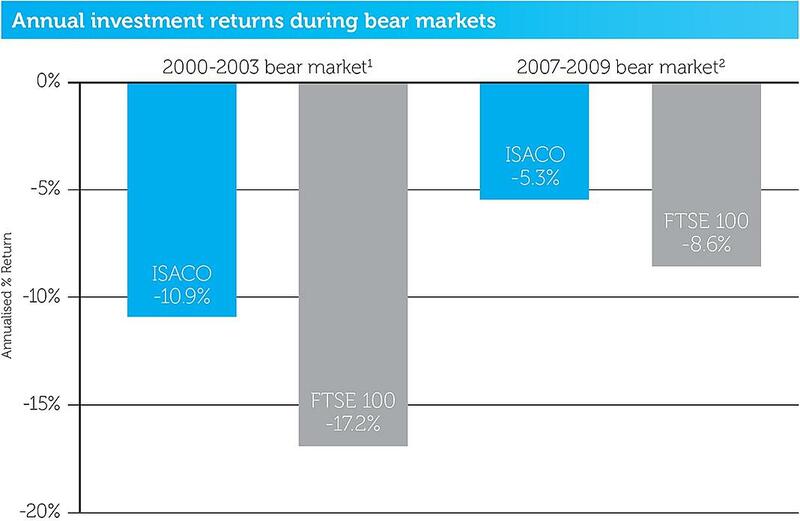 In the 2 year ‘subprime’ bear market, over the period 31st December 2007 to 31st December 2009 our annual return was -5.3% versus the FTSE 100’s -8.6%. Please be aware that this does not guarantee that we will continue to outperform in future bear markets. 1January 1st 2009 - December 31st 2018. 2Any ISACO fees have not been deducted in calculation. 3Figures used assume no tracking error. 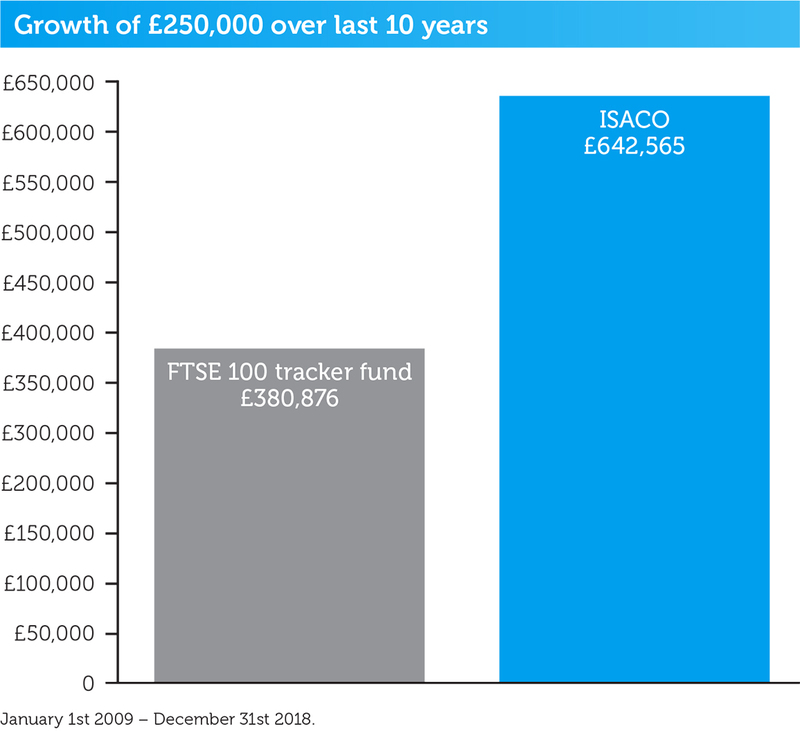 The figures also assume that the tracker fund returns identical returns to the index it is aiming to mirror. In most cases, tracker funds have scored a slightly lower return to the indices they are aiming to track. 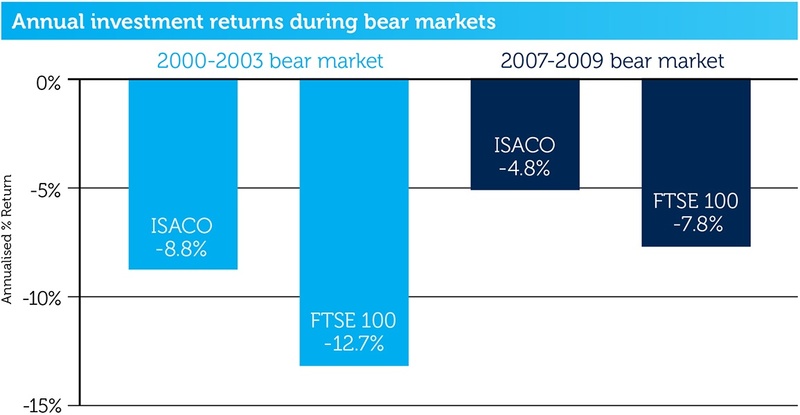 The returns presented are calculated from FTSE 100’s index returns on the Yahoo! Finance website. Period covered January 1st 2009 - December 31st 2018. Nothing is guaranteed and the value of investments can go down as well as up and you may get back less than you invest. Yes, ISACO is authorised and regulated by the Financial Conduct Authority (FCA). Our firm reference number is 525147. This means you have peace of mind knowing you are protected as a consumer. It means ISACO are policed by the UK’s main financial watchdog. Regulation by the FCA means the highest level of governance and transparency. It also means you are covered by the Financial Services Compensation Scheme (FSCS) which means you may be entitled to compensation from the scheme if we cannot meet our obligations. This will depend on the type of business and the circumstances of the claim. Yes, so if you complain and we cannot settle this to your satisfaction, you may be entitled to refer it to the Financial Ombudsman Service, Exchange Tower, London, E14 9SR. Tel. 0800 0234567. More information can be found at the Ombudsman web site www.financialombudsman.org.uk. No, even though we are regulated to offer investment advice, our service does not constitute a personal recommendation. The service allows you to ‘see’ what we are doing with our money which means you have the opportunity to replicate our trades within your own investment account. No, we have never been disciplined by the FCA or any other organisation. Please go the FCA’s site http://www.fsa.gov.uk/register/firmSearchForm.do and check for yourself. You will see that we have no complaints filed against us. Our firm reference number is 525147. Yes. We do, of course, comply with all applicable laws and regulations when carrying out our business activities, however, we see this as a starting point rather than a ceiling for our approach to treating our clients fairly. For ISACO it is not good enough for a business action just to be legal, we always act in a trustworthy and ethical manner. Specifically this means that we will always adhere to the following standards. We provide a complete and truthful picture of the service we provide, including the limits on our activity and your responsibilities as our client. We never accept any inducements (such as services or hospitality) from fund or platform providers. We are fully transparent about the costs of our service – there are no hidden or additional costs. All our clients have the opportunity to invest in the same funds that we personally own and buy them at the same price that we buy at. We fully and clearly explain the reasons for all of our investment decisions. 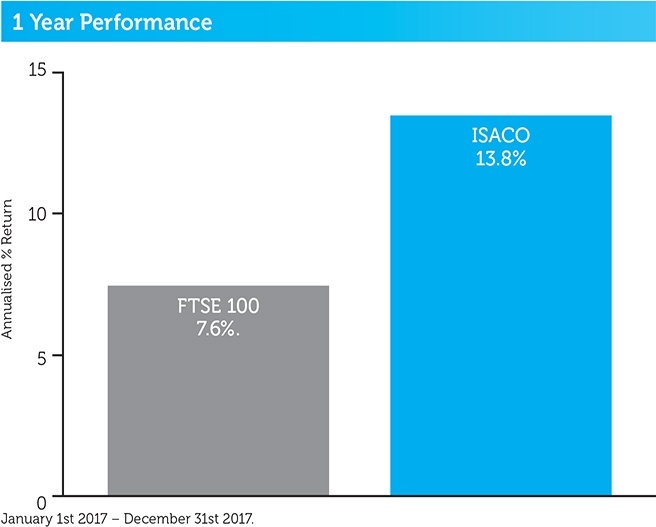 We always measure our performance against the most relevant benchmark, the FTSE 100, so that clients receive a consistent and clear picture of our results. We deal with all client enquiries promptly. We treat client information confidentially and do not share it with anyone outside of ISACO. We undertake a regular programme of continuous professional development in order to maintain and enhance our knowledge so as to provide you with a highly informed service. We use external assistance where we feel this will enhance the service we provide, but we monitor and take full responsibility for all such third party services. We undertake, and report on, an independent audit each year to ensure that our business activities continue to comply with this code of ethics. Yes, we do hold professional indemnity insurance. Our investment team consists of Stephen Sutherland, Paul Sutherland and Steve Todd who together have a combined investment experience of close to 50 years. Stephen, Paul and Steve are highly experienced investors and have all passed the IFS Level 3 Certificate for Financial Advisers examinations prescribed by the IFS School of Finance. Stephen and Paul are personally regulated by the Financial Conduct Authority (FCA). Due to successful completion of the IFS Level 3 Certificate for Financial Advisers qualification, they can all use the designation ‘CeFA’ after their name. Stephen Sutherland, the head of our investment team is also a bestselling author of the highly acclaimed Liquid Millionaire and the very popular How to Make Money in ISAs and SIPPs. 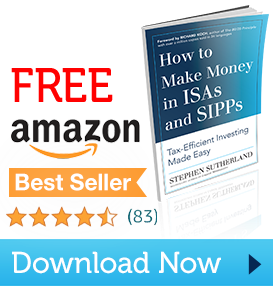 Stephen is known as an ISA and SIPP investment expert and has been personally investing in ISAs since 1997, when they were called PEPs. "Having taken the decision to consolidate all my legacy pensions into a SIPP, I remained frustrated that my IFA sat firmly on the fence in terms of recommending funds despite being aware of my risk profile. Discovering ISACO was a breath of fresh air – an organisation that believed so much in their own expertise that they actually put their money where their mouth is. In many ways it looked too good to be true. However, after long discussions with Paul & Stephen, two straight talking astute & knowledgeable northern guys, I took the plunge and invested 100% of my significant SIPP in a way that modelled ISACO's investment profile. Thank goodness I did, 6 months later the fund is up 8%, my financial investment stress levels are down 100% and I have made 2 new friends who I can trust to use their considerable expertise to manage their investments and as my SIPP is aligned I benefit. This service is unconventional and the decision to sign up was not easy, but 'fortune follows the brave ' and hopefully my faith in following simple logic, that an expert with skin in the game will deliver outstanding performance over the long-term will continue to be borne out." "When it comes to investment, it is hard to tell who is good - but I have been very impressed with Stephen and his record and the logic of his approach."